I've created a form, but can't find it in our list of my forms. The form is working at: http://www.hin.com/library/registerebookembeddedcasemanagement.html but I'd like to edit the form and see submissions and I can't find it. You may have already found it, but the sorting filters in the right hand side menu of your form list is useful for finding forms. I've created a few different forms over the last few days and cannot see any that I've created. 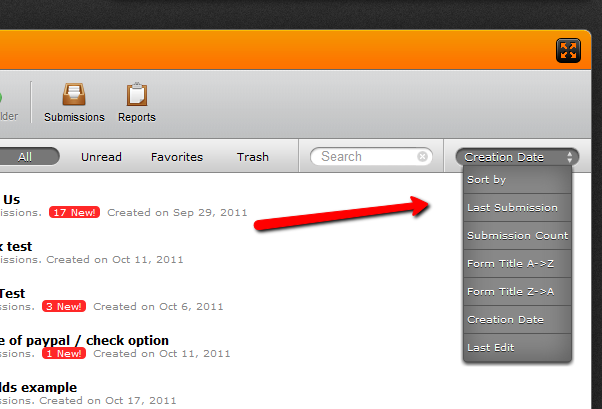 When i sort by creation date, the last one listed is from 11/7. I also searched on 13214438623, but am unable to see this form. Is there a limit on the # of forms created? What would cause this issue? I see that form associated with your account with two other forms created since 17-nov-2011. 1. logging out, clearing your browser cache, logging in and checking? 2. Try accessing your account from a different browser. Let us know if any of those do or do not work. Thanks deleting the cache worked. We're glad it's all ok now.